Here's one thing I know about you: You want your business to grow. Not everyone does. In fact, some people are quite content for their small business to stay small, which is totally fine. They're just looking for some extra money, and a side gig or a "professional hobby" will do. But I know you want to grow your business because it's not just about you. It's about your cause. Whether you're a nonprofit or a for-profit with a social mission, you want to increase your organization's capacity and influence because you're fighting for something. You may not have a desire to become the next TOMS or Habitat for Humanity, but you do have a desire to help more people. You want to have a bigger impact. You want to do more good. So, how do you grow your small business? There's one simple way that I recommend you start thinking about today: Get help. Yes, it may be simple, but I realize it's not easy. It's not easy to decide to spend the money. It's not easy to allocate your resources differently. It's not easy to bring someone new into your process. But I believe this one decision can make all the difference. It has for me, and I think it can do the same for you. And guess what? It may not even require hiring more staff. First of all, I realize it's a bit of a Catch-22. You'd be happy to spend the money to get more help...if you could only make more money in order to do so! I've been stuck on that hamster wheel myself, and some days honestly, I still am. But there is also something to be said for the old adage, "You have to spend money to make money." And I believe that's true. Maybe deep down, you do too. But, like I said, there's also plenty of good news! It may not require hiring more staff to get your organization to the next level. It may just require some creative, out-of-the-box thinking. Or some networking. Or some short-term effort. Regardless, though, it will require help. Why? You can only do so much at your current level—even if you already have a small staff. The Small Business & Entrepreneurship Council states that 89.4% of small businesses have less than 20 staffers. The Small Business Administration notes that about half of all small businesses make it to the five-year mark, with approximately one third seeing their 10-year anniversary. When looking at just women-owned businesses, Small Business Labs tell us that 41% of my #girlboss peers only have between two and four employees, while 51% are solopreneurs! Finally, this report by Babson College tells us that 70% of the small business owners they polled found it difficult to hire qualified employees. Besides throwing a lot of numbers at you, what am I trying to say? First, growing a business is hard, but I don't have to tell you that! Second, there is another way to get the help you need and grow your business without necessarily growing your staff, at least in the early stages when bootstrapping is the name of the game. So, how do you grow your business without hiring more staff? Keep reading. Check out an awesome article from Todd Herman on the "Five Stages of Business Growth." In it, he shows you exactly what you should be focusing on for each stage, which is incredibly helpful. I'm in Todd's program, and I can say that he is an very smart guy. Learning from him has been definitely benefitted my business. If you want to make it to that five or ten year mark, you need help. If you want to make a bigger impact, you need help. And if you want to avoid burnout for yourself or your staff, you need help. What does this look like? I think it looks like finding interns, learning from mentors, bartering for services, and/or hiring independent contractors. It could even mean a combination of all of those things—it has for me. You only know so much. You only have so much time. Why not fill those gaps with people who are there to assist you or are better suited for those tasks? Be the leader who sees the forest, not just the trees. As I talked about last summer, work ON your business, not IN your business. Why Is Getting Help for Your Organization So Important? Right about now, you may be asking yourself why you should be hiring interns, consultants, or indepdendent contractors, especially if it's going to cost you hard-earned money. I mean, what's the big deal? You can just look up a few more articles or take a few courses and figure out everything you need to know, right? Anything you need to learn is just a Google search away. Yes, that's pretty much true, and I'm guilty of the same thoughts and questions. But there are some INVALUABLE assets that come with these roles. And I’d like to explain by telling you how I've utilized consultants/interns/contractors in the past, both personally and professionally. They provide a set of fresh eyes. We can often lose perspective as we work on our own projects day in and out. Allowing someone to see them objectively can provide insight we couldn't gain otherwise. They cost you less than you might think. While the initial investment may seem significant, especially if this process is new to you, remember that these people do not cost you insurance or other full-time employee perks. You also don’t have to take taxes from their payments. They don't have to stick around long-term. Sometimes you just have a short-term need, or a season that requires an additional set of hands. These people rally around you when you need it, and not when you don't. They can relieve stress from you and your employees. Often small organizations rely on a limited number of people to do a wide variety of tasks. Sometimes, however, these tasks are not suited to their skills. Consultants and third-party contractors who specialize in certain areas can be invaluable to helping you reach your goals, while taking the pressure off your team. This will either allow them room to breathe, catch up on their primary tasks, or take on new assignments within their wheelhouse. They allow you to focus. Just because you can do something, doesn't mean you should. You need to be working on the tasks and goals that specifically require your time and attention. If you have the ability to outsource beyond that, do it. Focus on the things no one else can do for your business. They can provide expansion. These folks allow you to “go beyond” what you’ve already been doing. You can dream bigger, cast your net wider, and experience results you could not have had before at your current pace. But the ROI (return on investment) may be significant. Yes, it's important to consider the cost, but if you make more sales and donations than you would have without their help, it will be worth it! Well, of course, if you're looking for someone to help you with your writing, marketing, or communications needs, I'd be remiss not to mention that I can help you with those tasks. Whether you hate doing those kinds of things, or just need to focus on something else that's more deserving of your attention, I'm here. I launched Signify almost two years ago to help nonprofits, social enterprises, and other for-profits with a social mission with their marketing and communications. It’s been a crazy adventure! But I love being able to fill the gap for these types of organizations, especially the small ones that need my kind of help, but can’t afford a staffer or an agency. Most of the people I work with just need help for a short period of time, so I have the ability to pop in and out, as needed. And, during that time, I can help move their mission forward. My goal is to make cause-focused organizations look and sound more professional so they can build a larger audience, increase sales or donations, and do more good. Looking for an intern? Read this post. Want a mentor? Check this out. Need an accountability partner or someone to barter with? Try this post. I've also listed a bunch of friends that are incredibly talented and offer services that I don't. I trust them to take good care of you. When in doubt, ask around. We all have our own networks, and most people are happy to suggest someone or something that might be able to help you. I also love asking in Facebook Groups because they're already built around tribes. The point, though, is to not just sit and wonder. It's time to take action. I asked a few friends in these roles to share some advice with you. Keep these tips in mind when you hire independent contractors, freelancers, and consultants, so that you can make the best decision possible. "The first step is to make sure you (and most importantly, your audience) enjoy their overall style. They don't need to have an exact portfolio example of what you're looking for, but the general tone should feel right. Second, I'd look to see if they've worked with similar organizations or have experience in your field. If you're a nonprofit, for example, it can be so helpful to work with a designer who already understands the nonprofit language. Third, consider the energy: the design process requires a lot of honest and open communication. It requires vulnerability on both sides. I think it's important that you feel comfortable with your designer and would enjoy meeting with them! So, ask for a discovery call or meeting to see if the right energy flows! Your budget may require you to work with a less experienced designer, or a designer who doesn't have a distinct style yet. I wouldn't rule them out for those two reasons, but the energy has to be there." "If you’re ready for your online presence to capture the essence of your brand, and work to attract clients, you’re ready to hire a web designer. Before reaching out to an expert, spend time on their website and consider how it resonates with you. If it makes a great first impression, is engaging, and leads you to a clear call to action, you know they can do that for you. Having a beautiful website is one thing, but having one that works is another. My tip for you is to know that you need both!" "I think that a lot of people are naïve when it comes to the budget for any event. Many clients don’t know how much it costs to hire a good photographer, caterer, etc. so, they’ll spend money on little things and before they know it, they’re way over budget. My advice: choose your top three Items and spend the bulk of your money there. My top three are always food, music, and alcohol. I like invitations, but they aren’t the most important item to me. Now, if you’re a graphic designer or your company sells paper, the invitations are probably really important to you and that’s ok. Make invitations one of your top three. The important thing is to focus on what’s most important to you, and then build the rest of your budget from there." "It’s often easier to grab the admin assistant with the great phone voice, or the singing maintenance man for a quick 'read through' of your outgoing message, but resist the urge. It’s not enough to have a nice voice. A quality voice talent must be able to tap into the audience your trying to reach with the feelings you want to convey, so that anyone who hears it will want to take action. Your message is too important for it to sound like it’s being read from a handwritten notebook. With intentional script writing and the right voice, you’ll move beyond your customer or donor’s heads and into their hearts." "When you hire an expert to help you in a certain area of your business—listen to them. Trust them. You hired them for a reason, so let them do the job they were hired for. Sometimes that means taking a leap of faith and doing something different than you're used to. Sometimes it means trying something new that you're not entirely sure of. Experimentation is what business is all about—trying something new to take your business to a new level." I echo all of these ladies, and many of the same principles apply to copywriters as well! You may be stuck thinking that you don't have the money or time to find and hire contractors/consultants/freelancers/interns. I get it, and I've been there too. Plenty of times. And I'm not discounting those statements. They're valid concerns. But here's what I will ask you, "If not now, then when?" Make a plan to begin your search or interviews. Make a plan to save the money. Make a plan to ask for help. Otherwise, time will continue to fly by, and you'll be no better off in six months than you are today. After all, where were you six months ago, having these same exact thoughts? I don't want that for you. Your mission is too important. I want you to grow, have a bigger impact, and do more good. You've got a cause that you're fighting for. It's time to fight just a little harder. Grab our Independent Contractor Hiring Checklist so you can feel more confident in your next hiring decision. Thank you! Comin’ your way ASAP! I wrote last week that my business just celebrated its first birthday. That was a milestone many of you are eagerly awaiting, or remember fondly, as well. And for those of us who work solo or with only a small team, it's extra special because you not only don a party hat for yourself, but also for the dozens of hats you wear on a daily basis. I'm not sure it will ever get a lot easier, because I don't really know anyone, anywhere, at any size company who wishes they had more to do. But when you have a larger team, you at least have more of a division of responsibility. So, it can be challenging to look like a larger organization when it's just you at a desk in your guest bedroom, or just you and a few friends who decided to jump in and solve one of the world's problems over coffee one afternoon. However, looking more professional, like a large business would, can often mean more sales or donations, more support, sponsors, and more attention. It's more important than ever to utilize images in your content. In fact, did you know that Facebook will show your posts to more people if you include images? Yep, true story. Additionally, blog posts with images are more engaging to look at, and it's also easier to share them on sites like Pinterest. But if you aren't a photographer, or can't continually pay for stock images, you may feel a little stuck. Well, Unsplash is one answer. They have beautiful stock photography completely free of charge. You don't even have to credit the source, if you don't want to. Unsplash is my go-to, but there are oodles of other options if you Google "free stock photography." (It may take a bit of searching to find a site with the kind of photography that matches your brand.) Oh, and here are a few other sites, including a few that have video. Having a designer on staff isn't something that all of us can afford. Heck, we can't even hire a designer for every little thing we need on a weekly basis like blog posts, newsletters, email blasts, reports, flyers, or social media prompts. So, we need a workaround. Enter Canva. It's not perfect, but it is pretty user-friendly, and allows you to make pretty graphics without the use of a designer. One of the best features is the pre-built templates that make it quick and easy to get started. They have templates for social media, presentations, eBooks, infographics, flyers, brochures, postcards, ads, and much more. You can also buy additional templates, photos, and illustrations for just $1. I currently use the free version. Space on social media is limited and valuable. So, why take up half the allotted real estate with a hideously long link? Bitly is a terrific, free service that shortens links to usually around 15 characters. Now you can actually say what you need to say on Twitter, and leave room for sharing and hashtags too. Plus, it gives the indication that you actually know how to use social media. A number of companies also use Bitly, but have branded URL's that make them look extra spiffy. I'm going to try and learn about this soon, and if I do, I'll be sure to let you know on this blog. Until then, the free version is a great option. UPDATE: Check out this post where I compare 13 social media scheduling tools! Freelancers, entrepreneurs, and small businesses of all kinds tend to fly by the seat of their pants. Behind-the-scenes, there's some duct tape, hopes, and prayers holding things together. So, one not always easy, but simple thing you can do—and need to do—is protect yourself legally. All my clients, including friends, sign a letter of agreement when I start a project with them, which explains everything clearly so we are on the same page. And one thing I put off for too long, but have since rectified, is adding terms and conditions to my website. No matter if you're a nonprofit, or for-profit, you need to make sure you're up-to-speed legally. And The Contract Shop has helped me do that. Should you ever need to have people outside your organization sign legal documents, HelloSign is a great route to take. And you get three free documents per month. This is how I facilitate my client contracts and letters of agreement. It's also a much better option than emailing Word docs, having parties sign them, scan them, and email them back. Once all parties have signed electronically, each get a notification, and can download a signed PDF. Voila! For years, way back before it was popular, I've only had a cell phone. No home phone, and now, no outside office to host a phone anyway. But there are certain times, like on a public website or business documents, that I don't want to give out my cell. Google Voice is the perfect, free alternative. When someone calls my Google Voice number, it still rings my cell phone. It works a bit like call forwarding in that way. And you can also get voicemails transcribed and emailed to you. You can even select your phone number to make sure it's geographically close to you, or has a particular set of numbers that you'd like to use. I work from home, except when I'm at a coffee shop. So, much like the Google Voice, there are times when I don't want to list my home address on public or professional documents. So, I use a PO Box instead. I have the smallest box available at $38 for six months, which was the cheapest price in my research. And, the good ol' USPS has now gotten on par with other PO Box providers by allowing you to use a street address in case you don't want to list a PO Box. A decent looking website is non-negotiable these days. No one will take you seriously otherwise. So, the two most affordable and popular default options are Wordpress and Squarespace. I choose the latter for this site and am really happy with it. Both make it pretty easy to DIY a site if you can't afford a designer (or to update it after its been designed), but I prefer the options, security, and customer service that come with Squarespace. (And should you need a designer, I recommend Mad+Dusty.) Regardless, pick something that works well for you, and invest the time into making it look good. If you're running an organization of any size, I'd really love to tell you to stop using something like yourname@gmail.com. I think if people are donating to you, or buying your products, you need to kick it up a notch. They should feel safe in giving you money, and having your own branded email address gives a sense of comfort and professionalism. I pay just $5 per month for this service and it's well worth it. G Suite comes with other features as well, but the branded email is my fave. What have I missed? What helps your small business look more professional? Get 10 More Bonus Tools! Let me send you a list of these 10 tools, plus 10 more! Your small business will look shiny and new in no time! Each month, I'm inviting guest contributors to speak about additional timely, relevant and sought-after topics that are important for cause-focused organizations to be aware of as they grow. 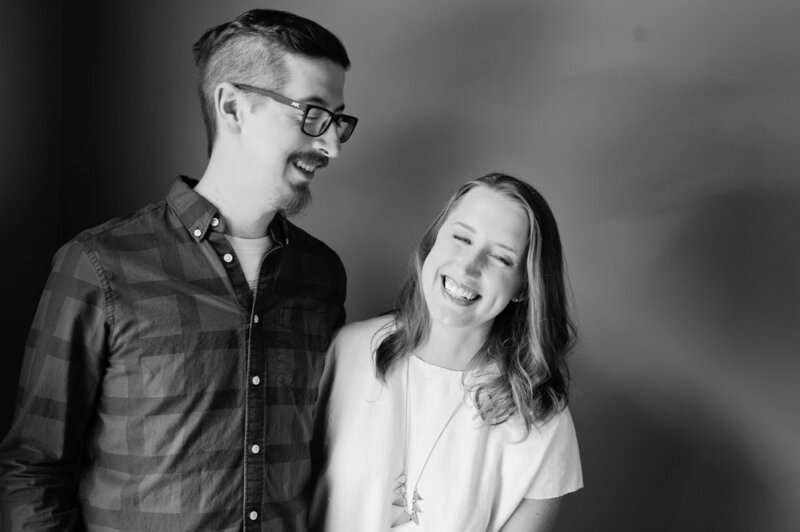 First up, we have my friends, Madison and Dusty Beaulieu, who expertly designed my branding and website! A. There’s definitely been a leaning toward illustration and texture. (YAY!) Flat design is huge, but now designers are taking that minimalism and giving it over to the artists. The desire for perfection in design is being replaced with a need for history and personality. We want to see the human hand in design now. Watercolor, paint, printmaking, hand lettering . . . the arts are showing up in a big way through design, and we love it. Q. What is the biggest mistake you see people making in terms of their brand? A. People give logos more credit than they deserve! Your brand is your tool box. Your logo, type, colors and patterns will help show your customers who you are in the same way that the clothes you’re wearing tell others a bit about who you are. Think of your logo as an accessory. If your purpose and brand values are not clear, appealing, and meaningful, an amazing logo won’t be able to fix that. Purpose and values are the foundation for your brand, and a good designer will help you clarify them before jumping into the logo design. Design that comes from the core of your business will work no matter what’s trending. Q. What is your best piece of advice for people during branding and design, especially for those who are new to, or overwhelmed by, the process? A. Be sure you understand the investment and what it will mean for your business. The branding process is not something to jump into half-heartedly. (We would make How to Style Your Brand by Fiona Humberstone required reading if we could.) The first six months of any business are unpredictable at best. I recommend that you quick-design a temporary logo using a template from Canva or another app, and build a one page site on Squarespace. After six months, sit down with a designer and discuss taking your business to the next level with an original brand. The branding process should feel like a celebration of your hard work and hustle. It’s an exciting time! Also, find a designer that you trust and enjoy working with, even if you technically don’t need one now. It’s kind of like finding the right doctor. When something comes up, it will be good to know who you’d turn to. Additionally, don’t be afraid to talk honestly about your budget. If a designer is passionate about what you do, they may be willing to find an agreement that works for both of you. And, finally, not all design is branding design. We work with several clients for 5-10 hours per month on designing emails, social graphics, and those random little items that come up. We love partnering with them, and they love delegating those would-be headaches. Q. What is one thing readers can do this week to improve their brand presence, either online or in print? A. Make sure you’re using all the same fonts on documents. (No more than three different fonts.) It’s the smallest thing, but it will instantly give your brand a sense of cohesiveness. Typography works very subconsciously. Make sure it’s working for you! Q. Anything else we should keep in mind for our brand, website or graphics? A. Be true to your values. Be consistent with your community. Be honest about your capacity. Simple, purposeful things done consistently make a brand shine. Are you making one of the Top 10 Website Mistakes?